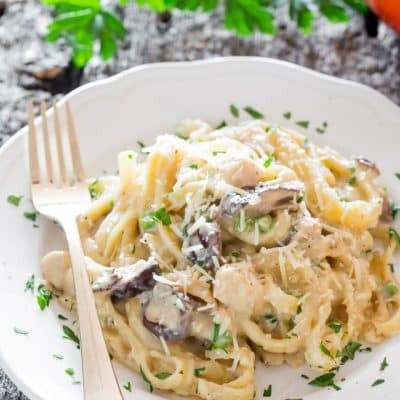 One Pot Chicken and Mushroom Tetrazzini – a simple but creamy, rich and delicious pasta dish with chicken and mushrooms ready in 45 minutes from start to finish. Perfect for busy weeknights. One pot meals! Is there anything better for a busy household? I think not! 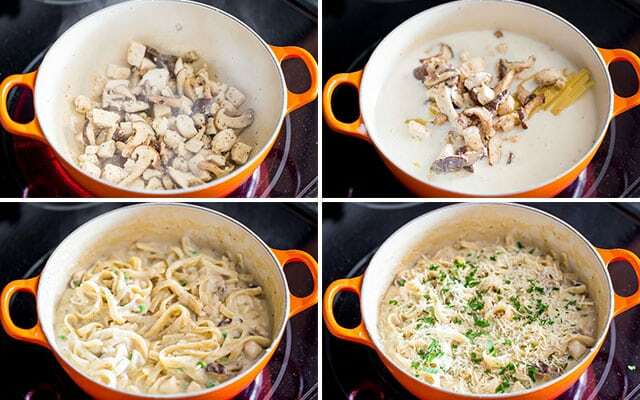 I love one pot meals and this chicken and mushroom tetrazzini is so easy and simple to make all in one pot and in only 45 minutes, it can be on your dinner table for everyone to enjoy! The beauty of this dish is that you can use different kinds of veggies, but I decided to go with mushrooms and peas. I always go with what I have in the fridge. And I had shiitake mushrooms, but regular white mushrooms will work just as well. While I always thought tetrazzini was an Italian dish, it’s not, it’s an American dish. Tetrazzini is usually made with diced poultry or seafood and mushrooms, in a butter/cream and Parmesan sauce. 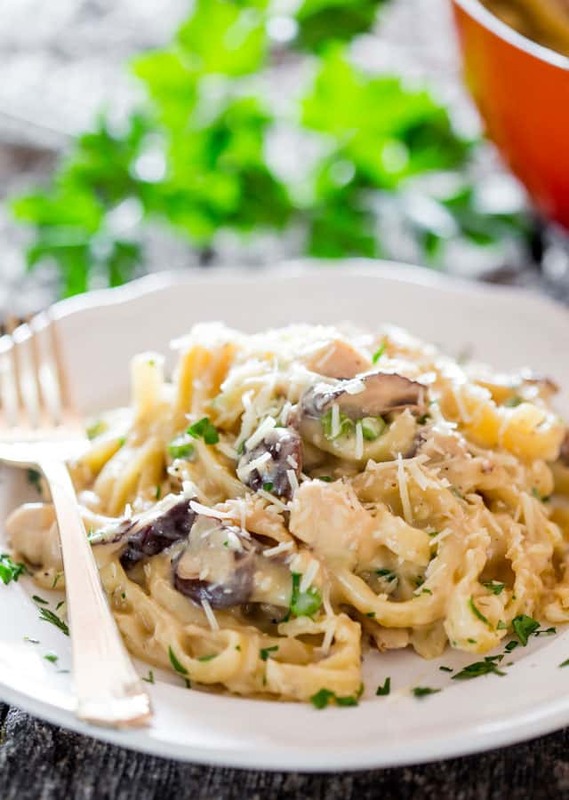 Tetrazzini is served hot over linguine or spaghetti and garnished with parsley and Parmesan cheese. It was actually named after an opera singer, who knew? So there is no universal standard for the dish, it’s like a free for all. The sauce is a creamy sauce made from butter, flour, milk and chicken broth, sort of like a bechamel sauce. Many times people would use cans of cream of chicken and/or cream of mushroom. In my one pot version I cooked the fettuccine directly in the sauce, to make things easier for you. Finish this off by sprinkling some cheese over the top. I used Parmesan cheese, but often times people add cheddar cheese. You can also bake the dish for a few minutes to give it a brown crust on top, however I decided against that here because I wanted a creamy version. Yes, you can freeze tetrazzini. Cover the dish with plastic wrap tightly and freeze. You can also store it in an airtight container in the fridge. Thaw completely, then bake it for 20 minutes until heated through at 350 F degrees. 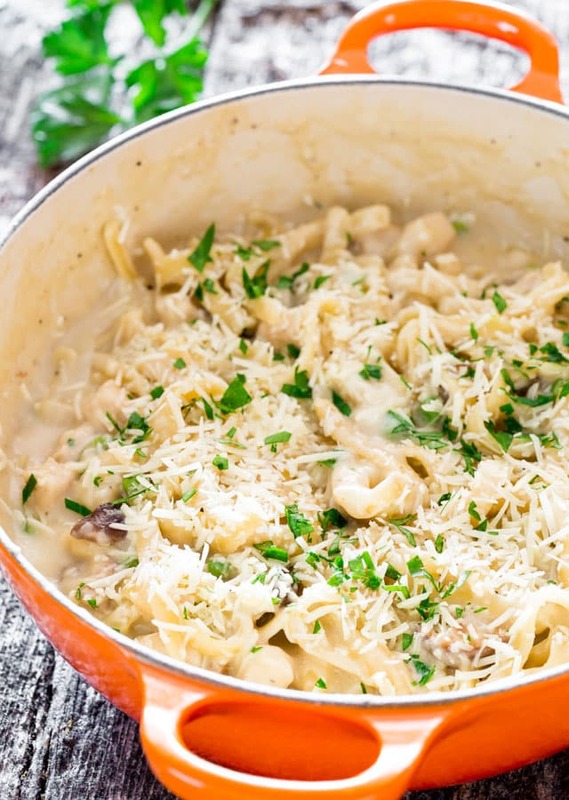 Although this dish takes a bit longer than 30 minutes, a whopping 45 minutes, it’s a simple recipe giving you a creamy, cheesy and delicious pasta. Perfect for the busy moms out there. 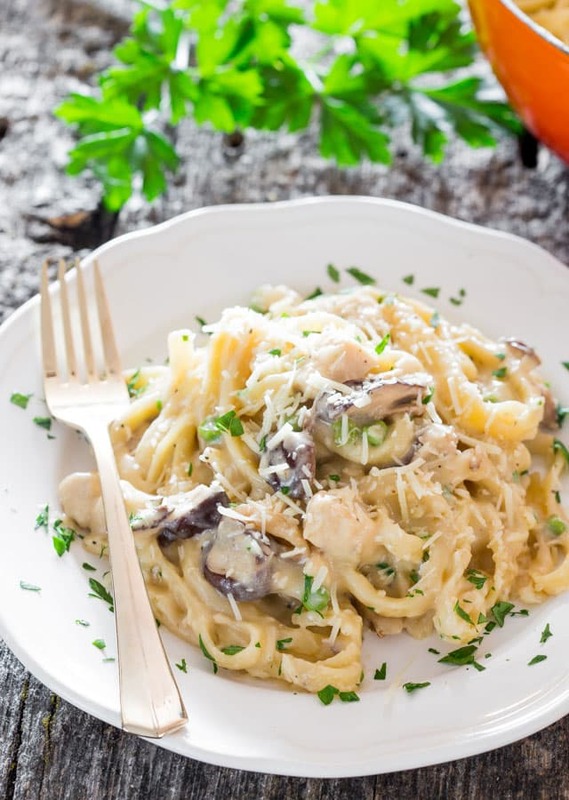 One Pot Chicken and Mushroom Tetrazzini - a simple but creamy, rich and delicious pasta dish with chicken and mushrooms ready in 35 minutes. Perfect for busy weeknights. In a large pot, melt 2 tbsp of butter over medium high heat. Add the chicken cubes and mushrooms. Cook for about 5 to 7 minutes until the chicken is no longer pink. Season the chicken with salt, pepper and garlic powder for a bit of garlic flavor. Remove the chicken and mushroom from the pot and set aside. Add the remaining 2 tbsp of butter to the pot and whisk in the flour. Add the chicken broth and milk and whisk. Cook the sauce until it comes to a boil, it should thicken as the flour cooks. Turn the heat down to low, add the pasta, the chicken and mushrooms back to the pot. Stir well. Cover and cook for 20 to 25 minutes until the pasta is al dente, stirring often to avoid the pasta from sticking to the bottom of the pot. After cooking the pasta for 15 minutes add the peas and season with salt and pepper if needed. Remove from heat. Sprinkle the Parmesan cheese over the top and parsley. If you prefer a brown crusty top, after adding the Parmesan cheese place the pot in the oven and bake for 15 minutes at 375 F degrees. Make sure you use an oven safe pot. We loved this simple dish as a way to use up rotisserie chicken. I doubled the chicken and mushrooms, and also added onion. Really lovely, family-friendly dish. Thanks for the wonderful recipes Jo! I have been lurking on your blog for several weeks and have made this dish and your Romanian stuffed peppers. They both turned out great. Your blog and recipes have been a real treat…. I will return for seconds. My pleasure, so glad you’re enjoying my recipes! Excellent dinner! Very tasty and the peas really add another dimension to the dish. This was a great after-work recipe. Everyone loved it. Everyone I have served this dish to has absolutely loved it. Even going so far as to request it when they come back. It is now a staple recipe in my Kitchen and one I will always keep on hand. I’m so happy you guys like this dish! Made this today for a hearty lunch. Next time I will use half and half for a thicker sauce, and I will use minced garlic instead of the garlic powder. It did thicken up after it sat a while, but it sure had me concerned when we first started eating it (thin sauce). My husband did say “it’s a keeper”, and he’s a picky eater!